The apartment complex: This is a low rise complex surrounding two swimming pools which are both accessed directly from the apartment. The apartment is directly opposite the children's pool. The accommodation is on the first floor accessed by stairs. It also includes a rooftop solarium which contains sun lounger’s and a barbecue. It has off-road parking and a small area at the side of the apartment for relaxing. The apartment itself contains a lounge/diner, 2 bedrooms, kitchen, bathroom and balcony. The lounge contains TV, CD player (including MP3 player), DVD player, a three seater sofa bed, a two seater sofa, coffee table and hair dryer. The dining area contains an extendable table which can seat six. In the double bedroom there is a double bed, built in wardrobe and a chest of drawers. The single bedroom contains bunk beds and a further pull out bed. It has a stand up fan for safety. The kitchen contains washing machine, oven, hob, sink, fridge, iron, kettle and microwave. Please note that the price of the apartment is based on 5 sharing. For each additional prerson please add £20 per week. Bolneuvo is a small village about 3km from Peurto de Mazarron. Is about a 50 minute drive from San Javier airport into which several low cost airline fly. 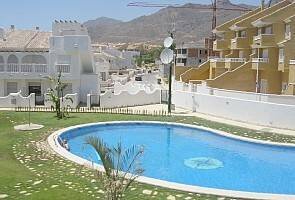 It can also be accessed using Alicante airport which is about 80 minutes drive away. The Costa Calida boasts one of the best climates in the whole of Spain with sunshine almost the whole year round. Bolnuevo is relatively unspoilt. It is a quiet area for most of the year but does get lively in the Summer months. Advice on the area as well as contacts for airport collection/drop off can be obtained from the owners. Local amenities Swimming, fishing, walking and cycling. There is a beautiful 18 hole golf course at La Manga (40 minutes away). There is an 18 hole golf course also at Fuento Alamo (30minutes away) and a 9 hole golf course at Camposol (15 minutes away). There is a wide range of restaurants from fish to Chinese to Indian to plainer fare. Althought this area has this international aspect it still remains a very Spainish resort. This is a new property built in 2005. It is a small complex surrounding two swimming pools, one suitable for adults and one suitable for small children. There is an area around the apartment in which to sit as well as a sun roof and a balcony. The apartment is on the first floor and so may not be suitable for some infirm people. it is generally very quiet but is a bit more lively in the Summer months.